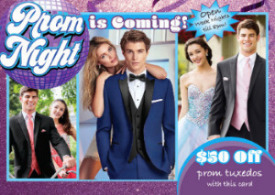 $50 Off Any Prom Tuxedo Rental! Mention our website. Have your wedding party rent tuxedos with us and Groom's Tux if FREE with 5 or more paid rentals! For all current specials, click here.